Which Computer Was The First To Come Standard With A Hard Drive? The Best Selling DVD Of All Time Is? Older geeks well remember a time when booting your entire computing experience off a floppy disk–and not off of a permanent hard disk inside the machine–was the only option for home computer users. 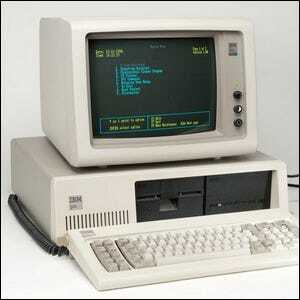 All of that changed with the 1983 introduction of IBM Personal Computer XT. IBM’s successor to their early-1980s offering the IBM PC, it offered something no other consumer computer had ever offered before: an internal hard drive. One 10MB drive, massive and pricey for its day, came standard with every IBM PC XT. That’s not all the $5,000 MSRP got you though, the machine also shipped with 128KB of RAM and a 360KB 5-inch floppy drive as well as a monochromatic CRT monitor and one of IBM’s beloved Model M mechanical keyboards.